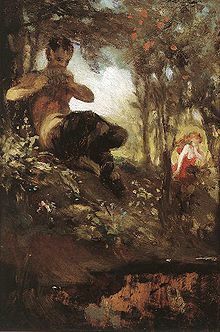 Pan (Greek: Πᾶν, Pān), in Greek religion and mythology, is a god of shepherds and flocks, wild nature, especially of mountain and forest wilds, hunting and rustic music, as well as a companion of the nymphs. His name originates in the Ancient Greek language, from the word πάειν (paean), meaning "to pasture." In modern times there has been a revival of reverence of the ancient god as a figure representing not only traditional and neo-Pagan forms of pastoral worship, but as one symbolic of general Romanticism, poetry, artistic craftsmanship and pantheistic or panentheistic notions of divinity or deity. "You will not find him dead easily. If he has been tipped out of the car, we shall find him rolling as a colt rolls in a field, kicking his legs for fun." "Clashing his hoofs," said the Professor. "The colts do, and so did Pan." "Pan again!" said Dr. Bull irritably. "You seem to think Pan is everything." "So he is," said the Professor, "in Greek. He means everything." "Don't forget," said the Secretary, looking down, "that he also means Panic." Swaying seal'd music up and down the wind. Crumbles to its complete oblivion. Eleanor Farjeon, in "Pan-Worship", in Pan-Worship and Other Poems (1908). To deities he honoured and dethroned! To crown the head that men have ceased to honour. Are keen and prick'd with old remember'd sounds. All my breast aches with longing for the past! Khalil Gibran, in Jesus, The Son of Man (1928), Sarkis an old Greek Shepherd, called the madman: Jesus and Pan. "And now let us play our reeds together." And their music smote heaven and earth, and a terror struck all living things. I heard the bellow of beasts and the hunger of the forest. And I heard the cry of lonely men, and the plaint of those who long for what they know not. I heard the sighing of the maiden for her lover, and the panting of the luckless hunter for his prey. And then there came peace into their music, and the heavens and the earth sang together. All this I saw in my dream, and all this I heard. Khalil Gibran, Jesus, The Son of Man (1928), Sarkis an old Greek Shepherd, called the madman: Jesus and Pan. You see the mountain, and hill following after hill, as wave on wave, you see the woods and orchard, the fields of ripe corn, and the meadows reaching to the reed-beds by the river. You see me standing here beside you, and hear my voice; but I tell you that all these things — yes, from that star that has just shone out in the sky to the solid ground beneath our feet — I say that all these are but dreams and shadows; the shadows that hide the real world from our eyes. There is a real world, but it is beyond this glamour and this vision, beyond these 'chases in Arras, dreams in a career,' beyond them all as beyond a veil. I do not know whether any human being has ever lifted that veil; but I do know, Clarke, that you and I shall see it lifted this very night from before another's eyes. You may think this all strange nonsense; it may be strange, but it is true, and the ancients knew what lifting the veil means. They called it seeing the god Pan. Arthur Machen, The Great God Pan (1894), Ch. I : The Experiment; an expansion of work first published in The Whirlwind (1890). We know what happened to those who chanced to meet the Great God Pan, and those who are wise know that all symbols are symbols of something, not of nothing. It was, indeed, an exquisite symbol beneath which men long ago veiled their knowledge of the most awful, most secret forces which lie at the heart of all things; forces before which the souls of men must wither and die and blacken, as their bodies blacken under the electric current. Such forces cannot be named, cannot be spoken, cannot be imagined except under a veil and a symbol, a symbol to the most of us appearing a quaint, poetic fancy, to some a foolish, silly tale. Arthur Machen, The Great God Pan (1894), Ch. VII : The Encounter in Soho. José Ortega y Gasset, in "Art a Thing of No Consequence" in The Dehumanization of Art and Ideas about the Novel (1925). We will look together for the Pan within. Mike Scott, in "The Pan Within" on This Is the Sea (1985). Mike Scott, in "The Return Of Pan" on Dream Harder (1993). a mighty voice cry "Pan is Dead!" Pan is dead — Long live Pan! This page was last edited on 18 July 2018, at 16:02.